I have some discretionary writing time today, meaning it’s okay to pick any one of 99 things to work on. Unsure of where to start, I consult the heap of to-do notes. The top piece of paper suggests a little chore with no commercial value, and not germane to any ongoing project of mine. Something to look up just purely because my nosy brain wants to know. How are you supposed to say “euphemism”? I once had a prof who said “yoo-foo-ism,” which I figured was either ignorance or affectation. Maybe at University he had belonged to an exclusive literary society, whose members recognized one another in the larger world by their twee mispronunciations of certain words. So the other day I’m listening to an audiotape of David Foster Wallace essays (not the ones he himself narrated) and it includes lists of words that interested DFW. For one of them, the reader says “yoo-fee-ism” – which I assume is “euphemism” with the middle M omitted. The definition Wallace had jotted down for it was “ornate, allusive, overpoetic prose style” which sounds right. 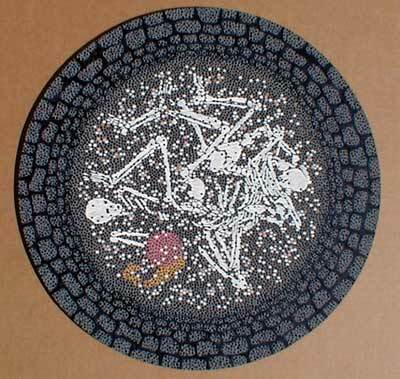 Among indigenous Australians, it is forbidden to use the name, image, or recording of the deceased. That opens up a world of questions. In my life as an artist, one of the peak experiences was an exhibit of Australian aboriginal paintings. I’m pretty sure some of their creators were no longer alive. Yet their names were displayed next to their works. In books, too. And theoretically, it would be wrong to use the name, image, or recording of any artist still living, either. Because after that person dies, the photo or recording, or the printed syllables of their name will still exist. Maybe the names of the dead should remain unsaid, but no matter how fervently the indigenous Australians hold that belief, I’m guessing that the government requires every kind of name on every kind of paperwork. The corollary to that would be, I bet everybody has a secret name that is never, ever divulged to the authorities or written anywhere. Because that would be the only way to observe the taboo. If some ancestor’s name is on a gallery wall next to a painting, so what? It never was their real name anyway. Or maybe I got this idea from The Last Wave. There’s another thing to look up. Along with the answers to several other questions raised by this notion. Also, a dead guy is the screensaver on my computer. Maybe I do him a grave (ha) disservice by keeping him around like that. Maybe in the spirit world, it is considered incredibly rude. P.S. In “euphemism,” the middle M is definitely pronounced. And anyway, it led to the thing about the Australians. The painting “Oubliette” could be yours!